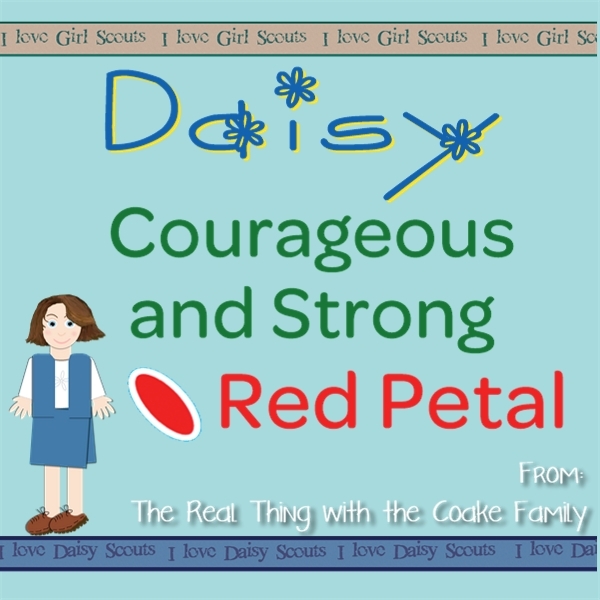 Do you have a Daisy Girl Scout in your house? Not only do I have a Daisy Girl Scout, I am the leader. It has been so much fun. 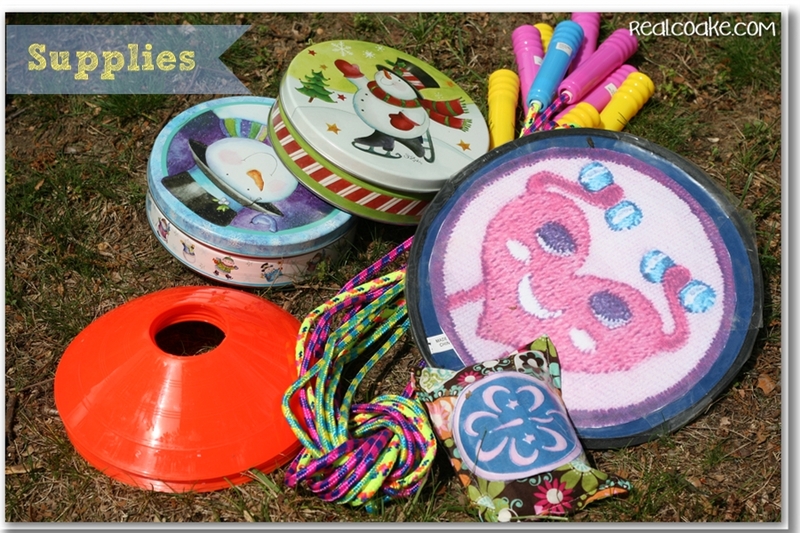 I have had fun planning activities for the girls to earn their Daisy petals. Today I want to share with you the fun night we had earning our red petal, which stands for being courageous and strong. We did this petal way back in October when the days were shorter. 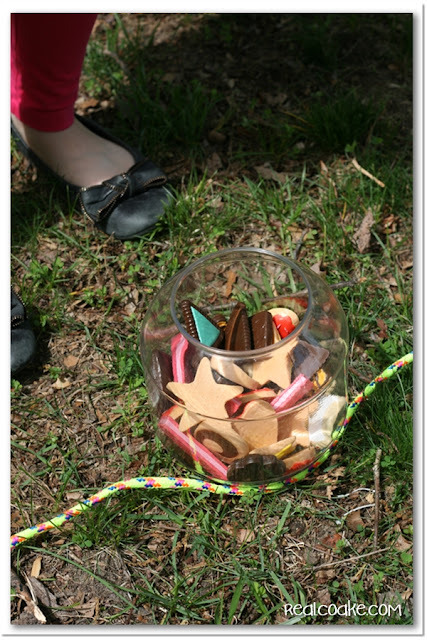 So, some of the pictures are from the meeting itself and some of them have been re-created on a sunny day in my backyard so you can see what we really did. Join me to see our fun night earning our red petal. After the pledge, promise and law, we started our meeting by pairing the girls up with a new friend and having them learn their friend's name and favorite sport. 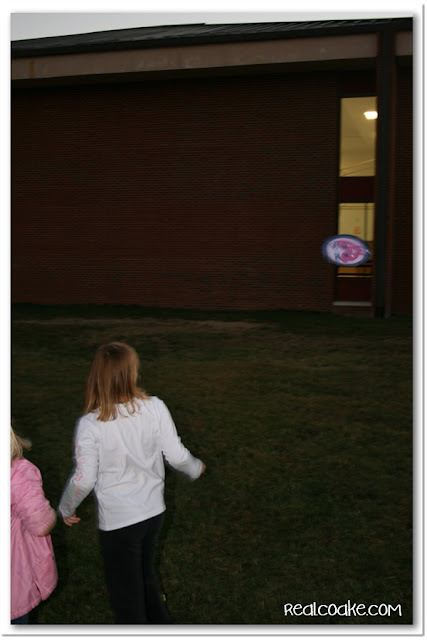 After our snack, we headed outside in the fading daylight to have some fun being strong. I'm super excited to show you my fun, and probably cheesy, games I came up with for us. I thought they were cute. The girls had fun! Yay! Next, we used my Frisbee, with an enlarge patch taped to it, to play the Girl Scout Patch Throw. I used the Junior Staying Fit Patch because it seemed to match the evening. It also was the right shape and I have another daughter who is a Junior. The girls had a bit harder time with this one. You can see from the picture above, this one little girl did get in quite a throw. Most of them had a bit harder time throwing the Frisbee. Because we did this in October, I called this our ‘Delivering the Nuts' obstacle course, but you could easily change the name and the tins to make this a Cookie Delivery obstacle course. I had two empty nut tins. 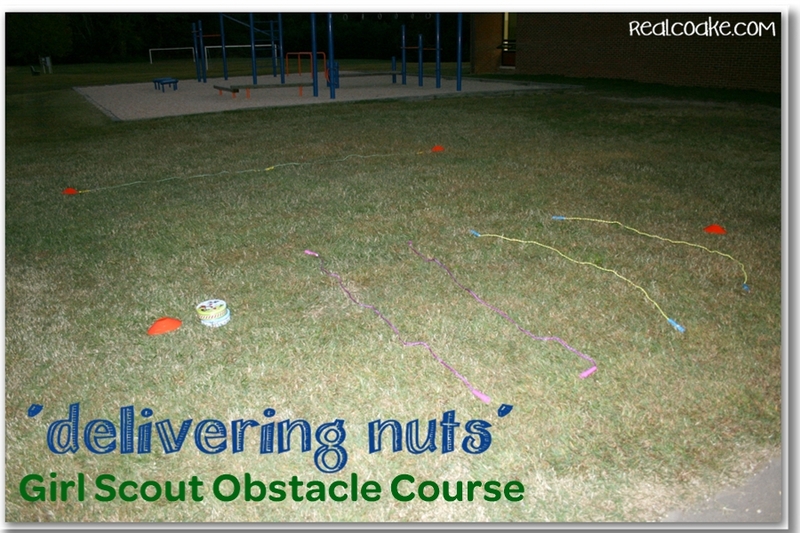 Each girl came to the start line of the obstacle course and decided if their customer had order one tin of nuts or two. They then collected the tins and set off to deliver them. This was one strange neighborhood in which to deliver nuts. First they had to jump over two rivers. The rivers are jump ropes placed in the grass that they jump over. Some of the girls were genuinely concerned about jumping over the jump ropes and really had to practice being courageous. I also held hands with a few of them because they were too anxious to try it on their own first. This surprised me and it was also really great practice for our red petal. 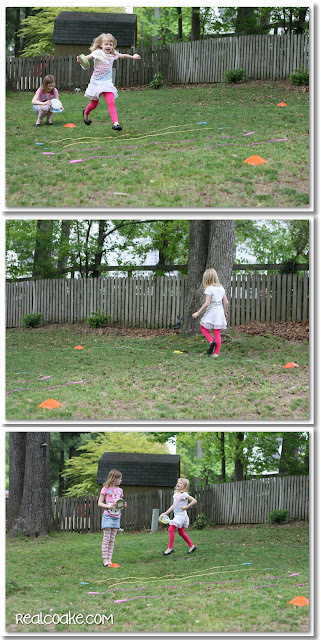 The obstacle course was set up in a square shape with cones on the four corners. So there were four actions in order to finish. After jumping the rivers, the girls needed to skip through the woods. Then the neighborhood had a rope bridge that they needed to cross to get to the house that had ordered the nuts. For this one, they walked on the jump ropes pretending it was a rope bridge. Finally, they were to run to the end of the course. I told them, we had to get across those rivers and go through the woods and cross the bridge so now we had to run or we might be late delivering our nuts. They totally know how silly I am…so I guess you are learning now, too! To sum this one up, use your cones to mark out a large square in your space. 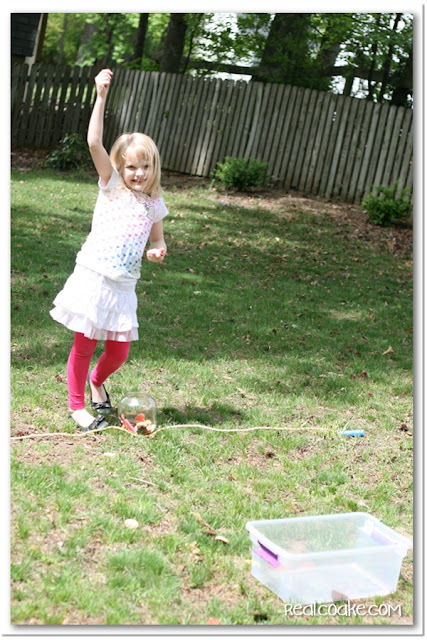 Place jump ropes (use 2 per river) to act as your river between the first and second cones. 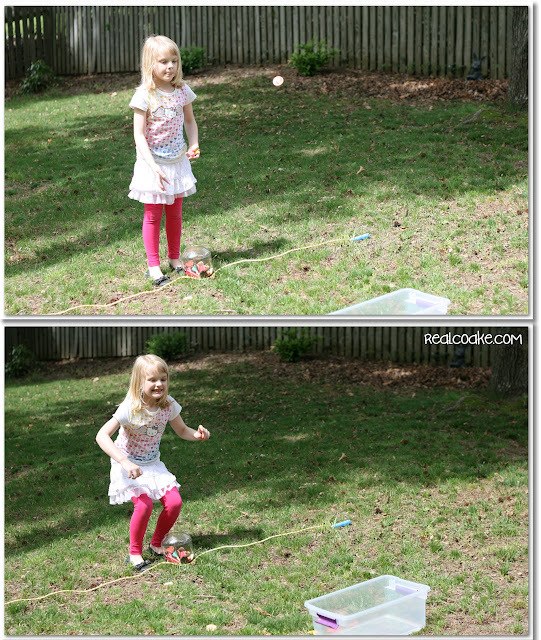 You will place jump ropes in a straight line between the third and fourth cones. We used the cookies that look like Girl Scout cookies and let the girls line up and get a turn trying to toss the cookies into the bin. Despite the dark, they didn't want to stop. (The pictures above are not from that night, it had gotten dark enough the pictures aren't that great.) They were having so much fun, but alas our meeting time was up. I am so proud of my sweet little Daisy's for being out in the dark and practicing being courageous. They also had so much fun showing me just how strong they were. Yay! Got one in! The girls most certainly earned their red petal. They also had a great evening. Great combo! Do you have other fun ideas for earning the red petal? Please share them in the comments, we would love to hear them. What about other fun Daisy ideas? Please share…I'm always looking for great ideas and I know others are as well. 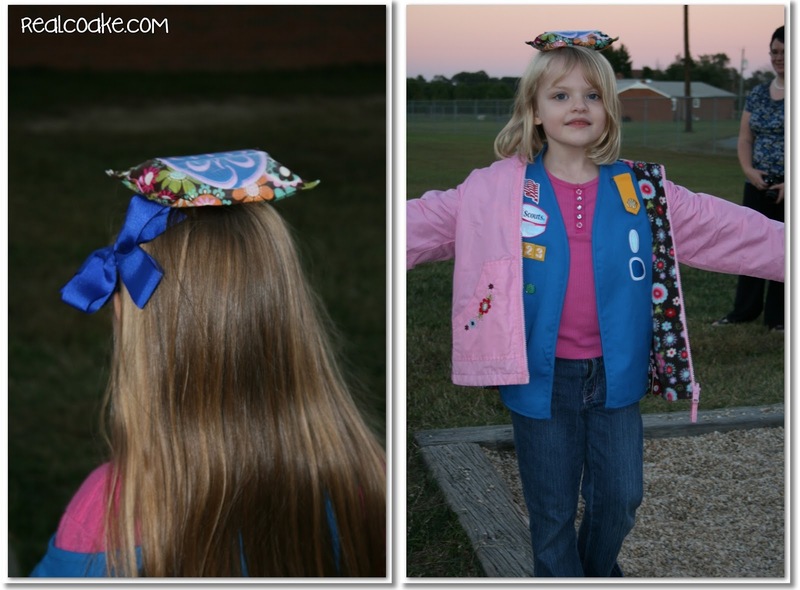 Follow The Real Thing with the Coake Family's board Real Girl Scouts on Pinterest. How fun! Yeah, my poor girls always have their patched forever before I actually get them on. I heard about using invisible thread (it looks almost like fishing line) to sew them on so you can’t tell how well, or in my case, or how poorly you did in sewing them on. Love that idea! Great ideas! I can’t remember if we’ve earned this yet or not but we have a meeting at the park next week so we can do these if we didn’t get it yet. I’ve pinned this to the GS Hang Out board on Pinterest. This is the type of post I was hoping to see lots of on that board. Actual meeting plans/ideas. Thanks, Diana! Thanks for pinning it to the group board as well. I’m glad I could help you out if you end up using the ideas. That is why I wanted to post it…I thought others might like it as well. Finding a well planned meeting is always a plus…less to do. This looks so fun! I can’t wait for my daughter to be old enough for Girl Scouts. Thanks for sharing at Pinworthy Projects. Thanks Carrie! I’m sure you will have a blast when your daughter is old enough. We have a lot of fun. How fun that you are their leader and plan such fun stuff for them to do! It is fun, Marie! I’m glad my daughter asked me to be her leader.